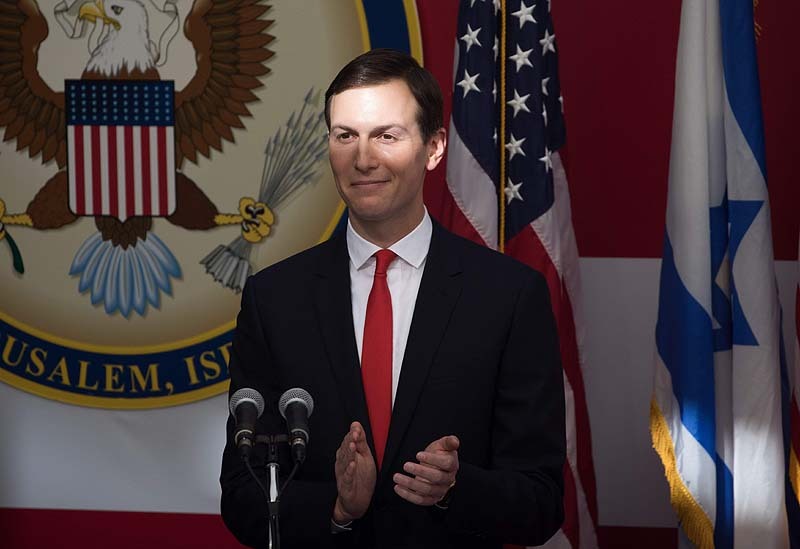 Jared Kushner at the official opening ceremony of the U.S. embassy in Jerusalem on May 14, 2018. President Donald Trump’s son-in-law and senior adviser Jared Kushner will visit at least five Arab countries in late February to request their rulers’ support for the promised US peace plan for Israel and the PA, as well as brief them rulers on the economic part of the ‘Deal of the Century,” as the president described it, White House officials said Thursday. The peace plan will only be revealed after Israel’s April 9 elections, so as not to add difficulties to Prime Minister Benjamin Netanyahu’s campaign—seeing as he is already expected to face an indictment before Israeli voters hit the polls. Kushner and Trump’s Middle East envoy Jason Greenblatt will spend a week in Oman, Bahrain, Saudi Arabia, the United Arab Emirates and Qatar and possibly two other countries (We’re in Bahrain, it must be Tuesday). Kushner and Greenblatt will be accompanied Director of Policy Planning and Senior Policy Advisor to Secretary of State Mike Pompeo Brian Hook, and Kushner’s 28-year-old protégé Avi Berkowitz. The American team will not discuss with their Arab hosts the “political component” of the Trump peace plan, which, according to administration official, “covers all core issues of the decades-old conflict between Israel and the Palestinians.” Instead, they intend to take their hosts’ temperature as to how much they would be willing to contribute in aid and investments to improve the lives of their brethren in the PA and especially in Gaza, the officials said. According to rumors, the new peace plan includes handing the new PA government—whether as a fully realized state or something less than that—the eastern part of Jerusalem to be turned into its future capital. PA Chairman Mahmoud Abbas has declared his refusal to discuss any proposed American peace plan because President Trump had recognized Jerusalem as Israel’s capital, but perhaps being given eastern Jerusalem would induce him to rejoin the peace process. “We hope Abbas reads the plan, judges it on its merits and comes to the table for negotiations after we release the plan. His people deserve nothing less,” a WH official said, adding that administration representatives have been meeting with “Palestinians from all walks of life” in the hope of eventually bringing the 83-year-old chairman on board.